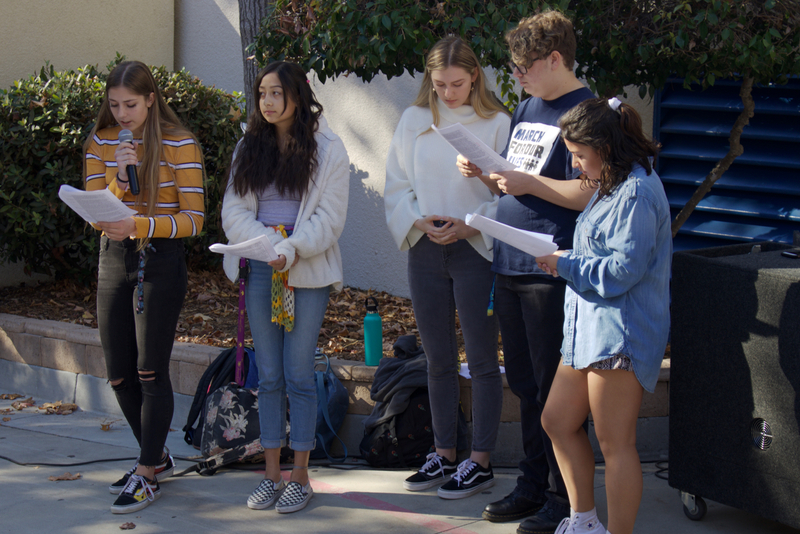 On Monday, Nov. 26, the first day Conejo Valley Unified School District schools were back in session after two weeks off due to the Woolsey and Hill fires and Thanksgiving break, a group of students led by juniors Jasen Cummings and Quinn Muscatel held a vigil to honor the 12 lives lost in the Borderline shooting on Nov. 7. 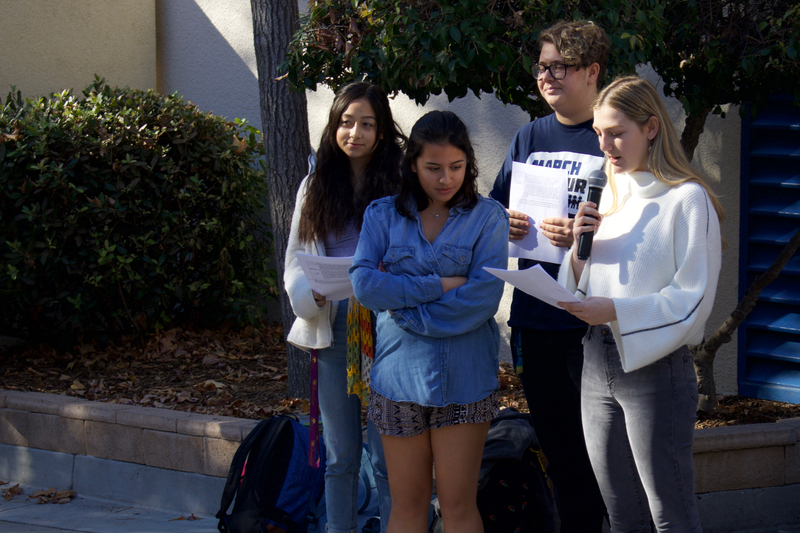 Students had the idea for the event when a student-run political organization focused on gun control, called Never Again SoCal, met over the break and “decided that something needed to be done to honor the victims of the Borderline shooting at our schools,” according to Cummings. Cummings and Muscatel are both founding members of the group. The group, with students from WHS, Newbury Park High School, Oak Park High School and other local schools, reached out to CVUSD Superintendent Mark McLaughlin to inform him of their plan. McLaughlin quickly responded to their email with his support. “[We chose to plan a vigil] because we never got to really grieve for the individuals lost, so we thought that it would just be a nice and peaceful thing to just have a memorial for people that never really got to remember them because of all the chaos during the fire,” said Muscatel. 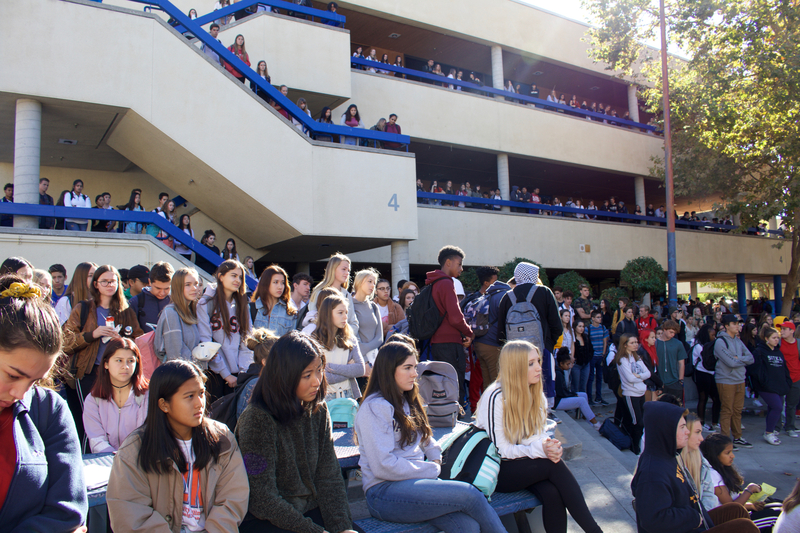 WHS held its vigil during nutrition on the first Monday back, from 10 a.m. to 10:20 a.m., while other schools held their memorials on various days of the same week. Never Again SoCal called the event the “Week of Walkouts” so that schools could plan a memorial that fit into their schedule. Never Again SoCal wanted to encourage other schools, both in the community and across the country, to host their own vigils in solidarity with Thousand Oaks. Student organizers created a “walkout toolkit,” which included a script with a “moment of silence, a bio on all of those who died and an intro and outro talking about our strong community, as well as encouraging those who need support in their mourning process to reach out for help,” according to Cummings. The WHS vigil was completely student planned, but the organizers coordinated the memorials with the district office since it was a district-wide event. District administration, including McLaughlin and the assistant superintendents in the Executive Cabinet, supported the idea. The organizers of the WHS memorial worked with administration to ensure the event ran smoothly. Principal Jason Branham extended nutrition, starting fourth period at 10:20 a.m. instead of 10:12 a.m. in order to allot more time for the vigil, and administration provided the sound system. On the day of the event, a crowd of students gathered in the amphitheater. Juniors Rylinn Cafferty, Cummings, Jillyn Kinsley, Madi McMichael and Muscatel led the event, alternating speaking into the microphone. Each speaker had his or her own reasons for wanting to participate in the vigil. The student organizers began by discussing the shooting and how the community came together in its aftermath. They reminded students that counseling services were available in the front office, then proceeded to read a biography of each of the 12 victims of the shooting. The vigil ended with a moment of silence. Many students attended the vigil, listening to the speeches and participating in the moment of silence. Students who attended the memorial were thankful for the opportunity to hear about the lives of each of the victims and to be given the chance to pay their respects. Overall, the student planners feel like the event was a success and that the main goal — honoring the lives of those lost in the shooting — was accomplished.